An excellent restaurant is not only about exceptional food, but also about great hospitality and the ability to meet the diverse needs of customers, blending tastes with the mind. 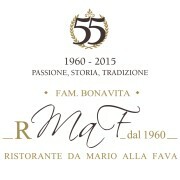 Trattoria “da Mario alla Fava” owners Guido and Luca use their experience with their staff to create emotions by inventing dishes that can be enjoyed in various menus like their “mezza porzione” or “half portion” which gives you the opportunity not only to experience one dish, but to enjoy others. We are at your disposal to make variations in our menu to accommodate food intolerances or allergies. In 2015 we have introduced a complete Vegan menu where you can enjoy your favourite Vegan dishes from Starters to Desserts.